Dietary fibre is the substrate that determines symbiosis and symbiotic evolution. The endosymbiotic archaea regulates human functions and species type and depends upon the colonic archaea whose density is determined by the fibre intake. Populations with low fibre intake have lesser density of colonic archaeal microflora and endosymbiotic archaea. Endosymbiotic archaea contributes to neanderthalisation of the species. Dietary fibre is the substrate for symbiotic evolution and human species evolution. 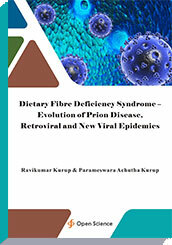 Dietary fibre deficiency and increased archaeal endosymbiosis can lead to retroviral resistance and increased generation of new RNA and DNA viruses producing catastrophic epidemics. The endosymbiotic archaeal overgrowth mediated neanderthalised version of homo sapiens generates new mutated RNA and DNA viruses as well as retroviruses at the same time being resistant to them as in the case of the species bat. The homo sapiens do not have the Neanderthal mechanisms of immune activation as their archaeal load is meagre. They serve as fodder for infection from Neanderthal generated viruses and bacteria and suffer eventual extinction.